As fashion girls, we might spend most of our time obsessing over current clothing trends and stalking our favorite accessories online, but we also lust over our fantasy closets on a regular basis. We dream about having all our handbags and shoes stacked just so, placing the perfect tufted ottoman in the right spot, and so on. Besides, chic closets are nearly as drool-worthy as the statement heels Victoria Beckham can't stop wearing. That said, obtaining a perfect closet might seem like something in the distant future that requires an unlimited budget. However, there are a number of wallet-friendly ways you can start crafting your dream closet right now—including paying a visit to your local IKEA. The Swedish interior mega-retailer has a number of pre-designed closet spaces that are surprisingly chic. Scroll down to see several of our favorite IKEA closets. Add a chic chair for functionality and flair. Use white hangers to keep the space looking clean. 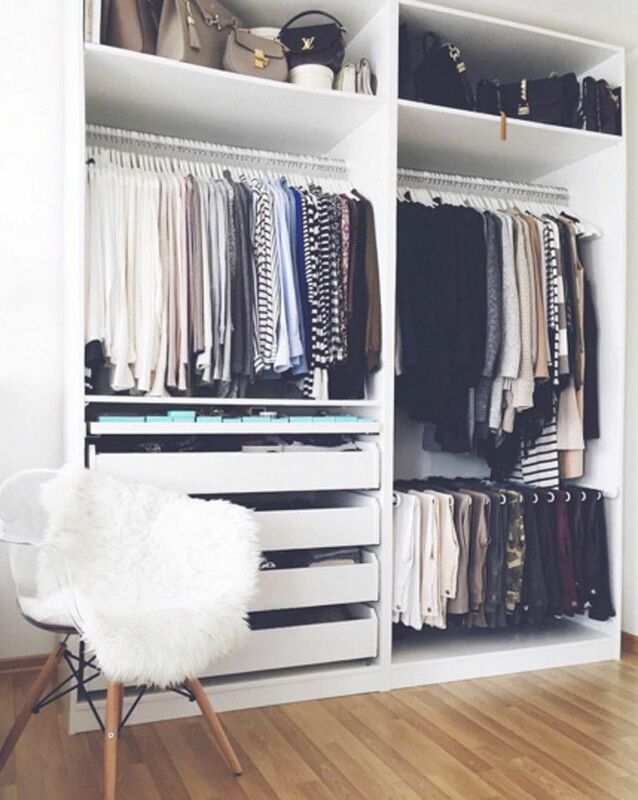 Make sure there is a space for everything so your closet stays organized. Organize your shoes with pull-out drawers. Add a rug to pull the room together. Go on to shop key closet essentials from IKEA. This low dresser also doubles as a TV stand. This streamlined mirror is perfect for a walk-in closet. Pull your room together with a cool rug. We love this piece that makes for cool, modern lighting. What are your favorite closet essentials? Let us know in the comments below. This post was originally published at an earlier date and has since been updated by Kristen Nichols and Aemilia Madden.